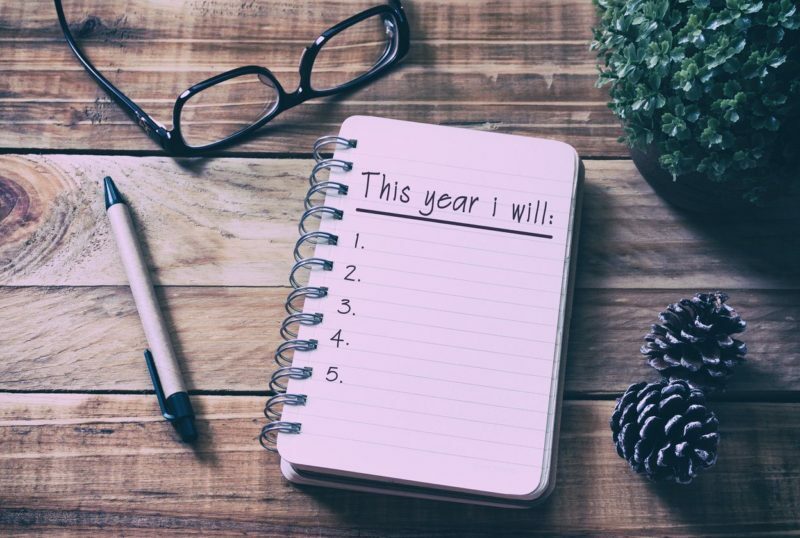 Amidst the crazy holiday season, we inevitably start thinking about New Year’s Resolutions as we say goodbye to this year and look forward to the next. We all have goals and aspiration for what we want our lives to look like. Continued growth is an amazing mindset to have. Yet many people quickly give up on their resolutions after just a few weeks or maybe never even start them at all. Why is this? One of the main reasons is that the goal you have in mind is not actually your own. You choose something based on what society has in mind or what others you know are doing. Or maybe the goal is something you truly want but you don’t define it with steps for how you will accomplish the goal. Accountability can be another tough thing to overcome, so having a buddy or keeping a journal can make it easier to see progress and keep on track. I can speak from personal experience in that I grew tired of feeling pressured to set a goal and then get upset with myself when I didn’t see it through. I then boycotted setting New Year’s Resolutions at all, or did them at different times of the year. About five years ago I changed things all together, I decided that instead of setting unrealistic expectations I would instead decide to learn how to do something new every year instead. Instead of calling them resolutions (which can have a negative connotation) I simply call it my growth goals. It is so important for brain and nervous system function to learn new tasks because it builds new pathways in your brain. As a bonus, it’s just plain fun to have new experiences. Some examples of things I have done include taking Irish dancing lessons with a friend, getting my 200-hour yoga teacher training certification, and learning how to make mosaic tiles. This year I have decided to start snowshoeing, we are so lucky to be in a part of WI that has 2 different parks where you can rent snowshoes to start learning. Maybe this idea does not resonate with you and that’s totally fine too. You can find your own may to make New Year’s Resolutions fun AND attainable. Here are some other creative ideas for you to ponder. 1.Take a personal development course. There are courses on meditation, developing leadership or creativity. You name it, the sky is the limit. 2. Earn a new career certification. 3. Read 12 books, one per month. If you are someone who does not feel they have time for reading try a book on tape. It makes my 25 minute commute fly by! 4. Purge the negativity from your life by unfollowing anyone on social media platforms that makes you put yourself down or feel bad. Best thing I ever did. 5. Eat whole foods for a set period of time, doing a Whole30 can be a great way to change your outlook on food. I am doing my yearly one in January this year to start the year off right. 6. Complete a no-spend challenge. This is where you track all the money you spend in a month to see where you can cut down in order to build up your savings. I was able to pay off a credit card by doing this. 7. Travel somewhere you have never been. Who knows what you could see or learn. 8. Make it a habit to once a month see close friends. Put it on the calendar well in advance and stick to it to keep cultivating relationships. My girlfriends from college and I have a “breakfast club”. It is the third Saturday of the month and we take turns planning it, whoever can come does and it is something I always look forward to. In the end your growth goals should be fun, teach you something and above all help you create healthier habits. I would love to hear if you try any of these and if you get something valuable out it. I am always looking for new fun ways to make each year better than the last.